You can use your own email server to send replies on tickets. This can configured under the category's settings. Step 1: Navigate to Manage >> Categories and click edit next to the category you're looking to configure the SMTP for. Step 2: Scroll down to Outgoing Mail Options, click show advanced options, and accept any pop-ups or prompts that appear. 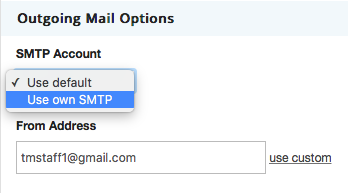 Step 3: Select "Use Own SMTP" from the drop down menu under SMTP Account. 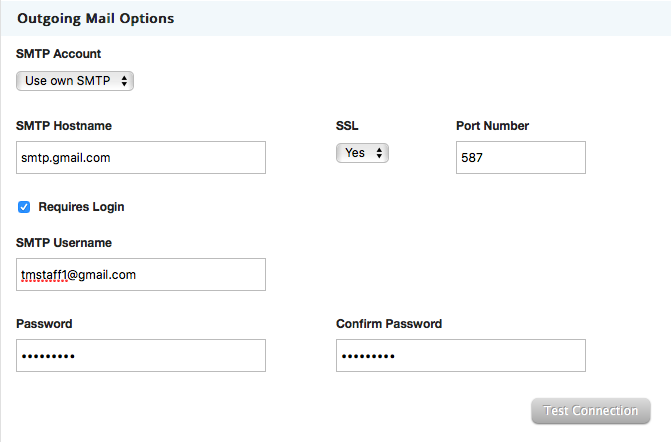 Step 4: Enter your SMTP account's hostname details and credentials in the respective fields. Step 5: Click "Test Connection" to verify if the credentials you entered are all correct, and to confirm if the SMTP server connection works. Once you see the above pop-up appear, that means you're all good to go. Just scroll down to the bottom and hit save settings to confirm the changes you made.